When most people imagine a safer future involving autonomous vehicles, the thinking is often focused on the capabilities of the cars themselves, varying levels of autonomy, specific safety features, and the passenger experience. 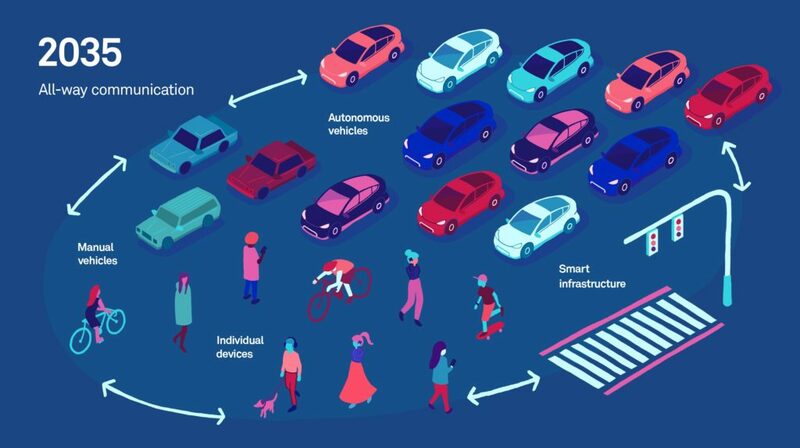 However, if we look beyond the car to include the many players and platforms involved in the transportation system as a whole, a more significant opportunity emerges: the chance to design a fully integrated solution that gets better as the network grows. 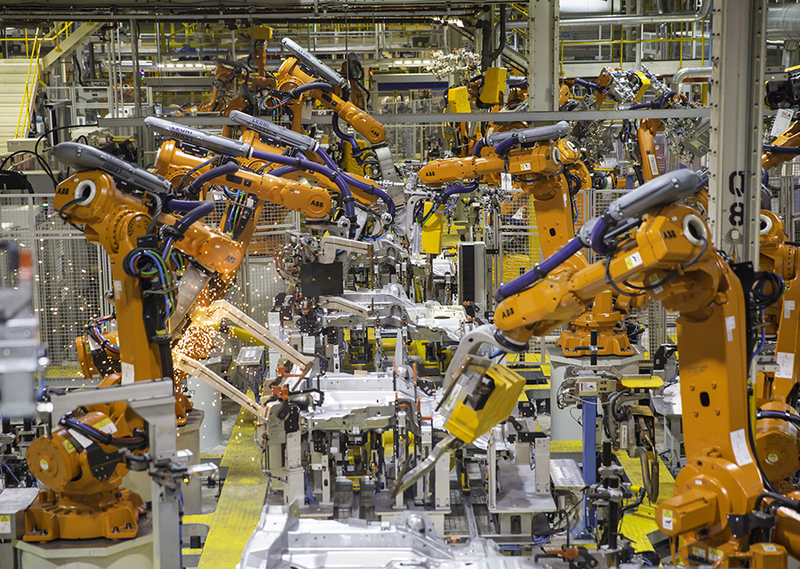 We examined how a long-term strategy could align multiple layers of devices, products, platforms, and environments to work together over the next 15-20 years and evolve as technology matures, policy advances, and infrastructure keeps pace. To illustrate this holistic approach, we envisioned how a single intersection might look in 2020, 2025, and 2035 to show how a systems-level strategy for autonomous vehicles would lead to safer outcomes for people, business, and society. 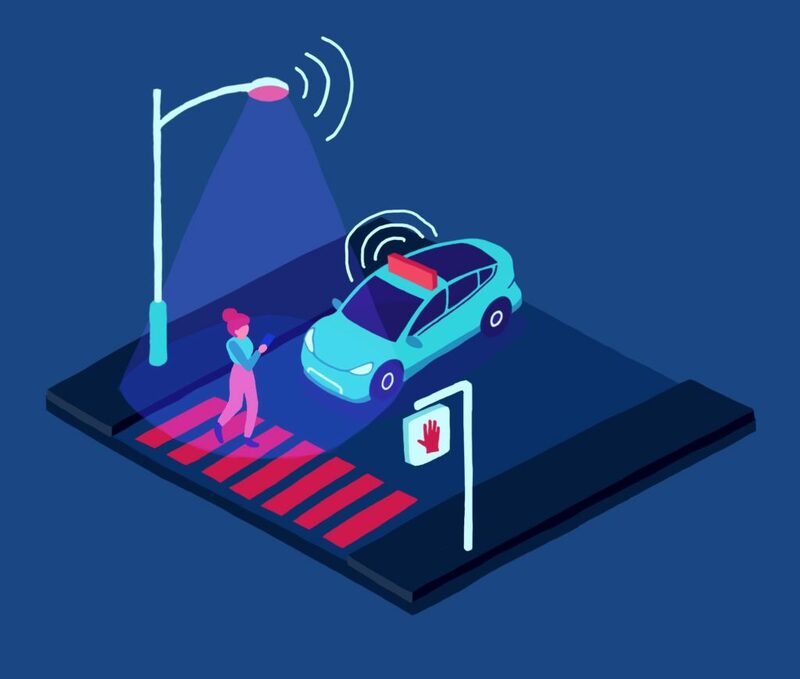 Within a few years, semi-autonomous vehicles will be able drive themselves in stable traffic and intervene if human drivers encounter dangerous situations. At a typical intersection, imagine that a pedestrian named Cassie absentmindedly strolls through a crosswalk during a red light because she’s focused on her phone. Driving along in his semi-autonomous car, Mike doesn’t see Cassie because it’s dark outside. Fortunately, Mike’s car detects Cassie in its path and self-brakes to avoid hitting her. At the same time, the corner streetlight senses Cassie illegally crossing the street. It illuminates the crosswalk more brightly and flashes warning colors to alert oncoming drivers. Cassie notices the warning illumination, looks up and sees Mike’s approaching car, and scurries back onto the sidewalk. In this situation, improved sensing systems and coordinated response are the first step toward an integrated system. By 2025, autonomous vehicles that can drive themselves in most urban environments will share the road with both semi-autonomous and manual vehicles. 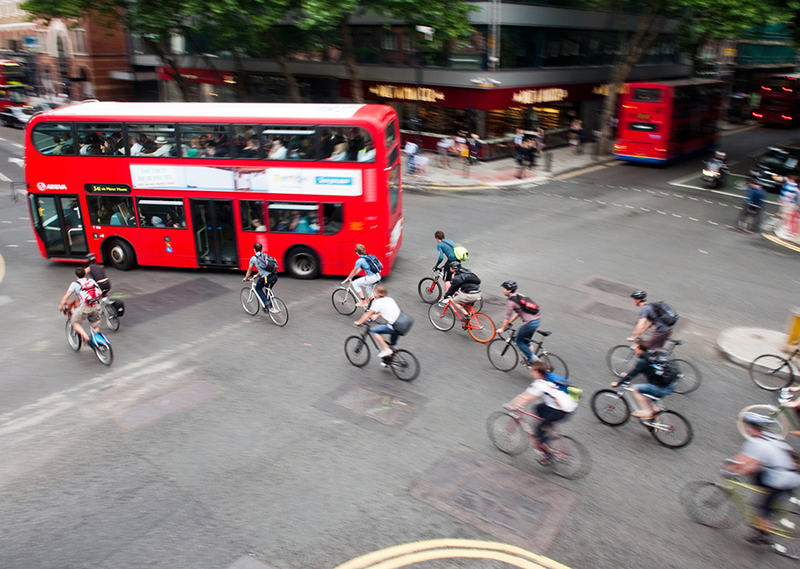 While it will take some time to adjust to new driving customs and right-of-way, connectivity and regulation will help to lower the risk of collision. In this scenario, Cassie on her way to happy hour with friends. Having learned nothing from her near miss in 2020, Cassie is about to jaywalk during a red light and doesn’t notice the self-driving car that has turned into her path. Fortunately, the self-driving car is adhering to automatic speed limits and is traveling at a lower legal speed than manual vehicles and has enough time to detect Cassie. The car also pings an alert to Cassie’s phone, which instantly rings and replaces her messaging app with a warning screen. Noticing the warning, Cassie does not walk into the street with oncoming traffic. Through two-way communication, the self-driving car and Cassie’s personal device work in tandem to avert a collision. Here, greater degrees of connectivity between multiple devices and platforms increase the fidelity and performance of the system. By 2035, public and private organizations will partner to fundamentally change the way we move about in cities. 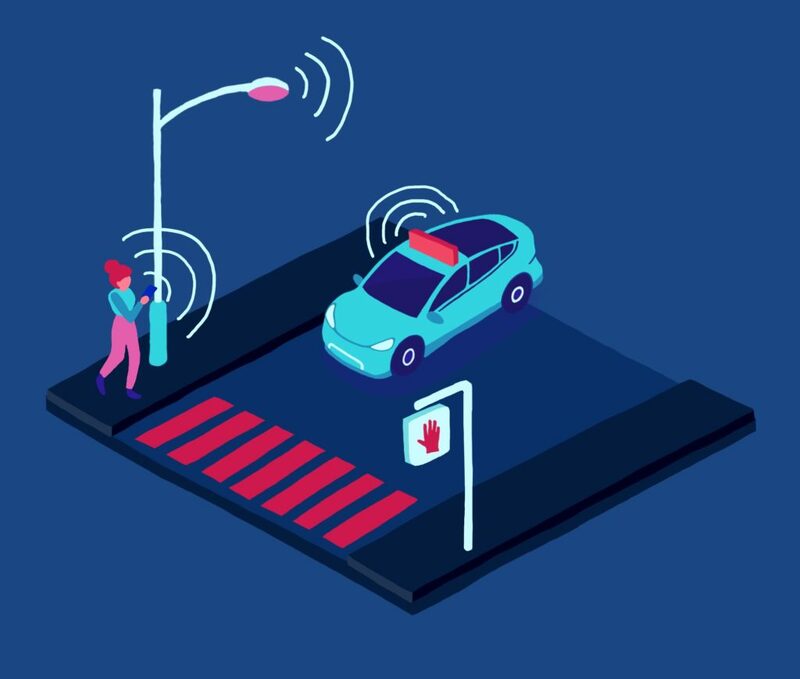 They will leverage data to reshape our urban environments, including separate zones and traffic rules for autonomous vehicles, pedestrians, and other modes of transportation. This time, Cassie is running late to a meeting and decides to cross a vehicle-only street to get to her destination. The first oncoming car triangulates Cassie’s movements by tracking her personal device. It predicts that she will soon be in its path and immediately stops. To avoid getting rear-ended, the car transmits a warning to all other self-driving cars on the street, directing them to slow down. At the same time, cars that are about to enter the street are re-routed by the city infrastructure to avoid congestion. Cassie eventually crosses the street, but does receive a ticket for her traffic violation and vows to do better in the future. 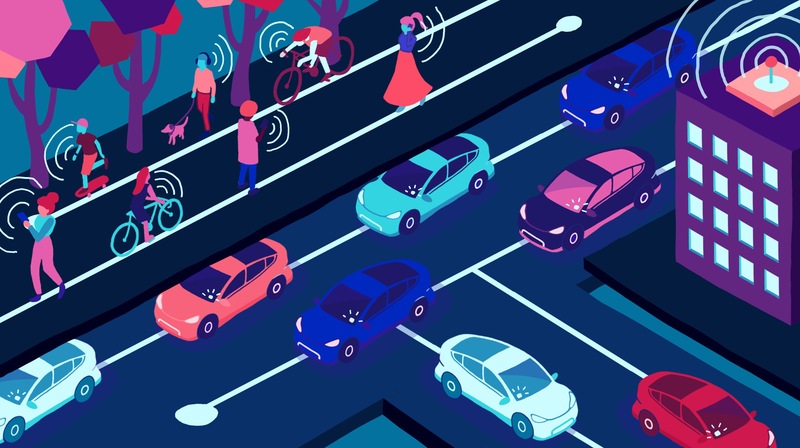 In this phase of development, near-universal connectivity and integrated infrastructure will allow self-driving cars and cities to predict and mitigate potential risks, influencing behavior and creating preferable outcomes. To enable this future, there will need to be significant alignment and collaboration between corporations, government, and society to ensure that our collective interests are prioritized over any single platform, product or technology. The journey begins now, while the technology is in its formative state, and before today’s decisions become tomorrow’s standards. AI and the future of design: What will the designer of 2025 look like?